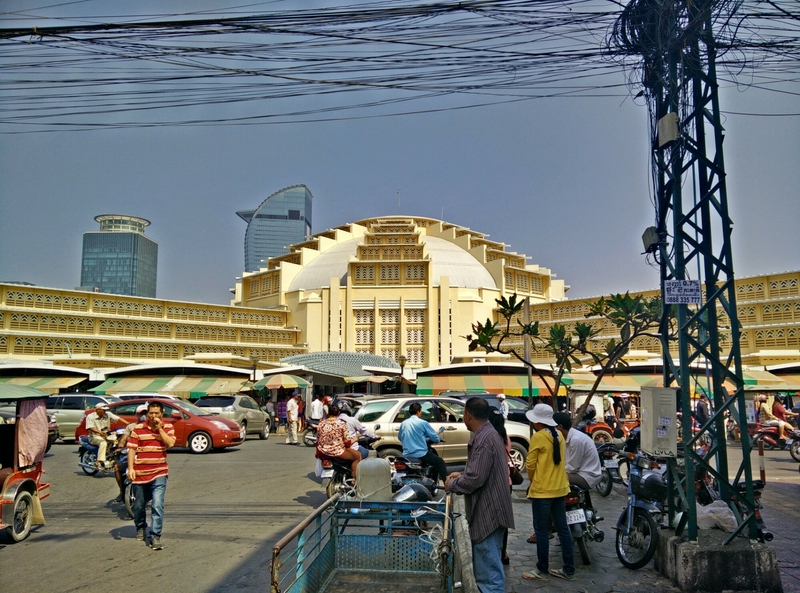 We’ve seen a lot of markets and malls, but they say Phnom Penh’s is not to be missed. The largest in Asia when it was first built in 1937, it was updated in after having been bombed in the Fraco-Thai war and then again in 1992. It is a spoke and wheel environment, so the center archway shows glittering gold and gems, then down one side is clothing, another produce and food, another school books and papers. 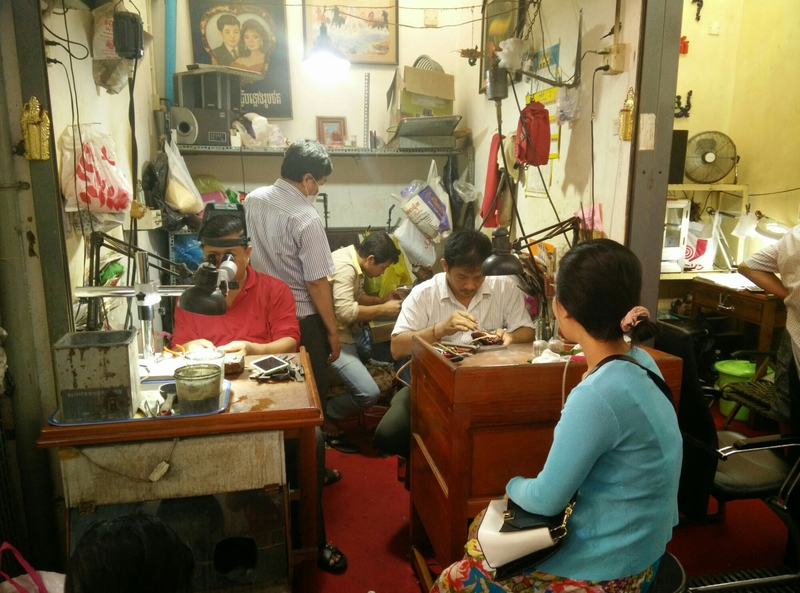 One of the most interesting sections for us involved jeweler stands polishing, designing and crafting for clients who seemed to be getting the Chinese New Year holidays. No new bling for me, but lots of entertainment. We went for pulled noodles for lunch which was delicious and settled my stomach a bit from its morning mutiny. Then we opted for unsettling in an afternoon viewing of The Killing Fields. I’d remembered my mom talking about it, but neither T nor I had seen it. Conveniently, it shows all over Cambodia to generations of travelers like me who only know Sam Waterston from Law and Order. Mom as usual was right – it was a must see. 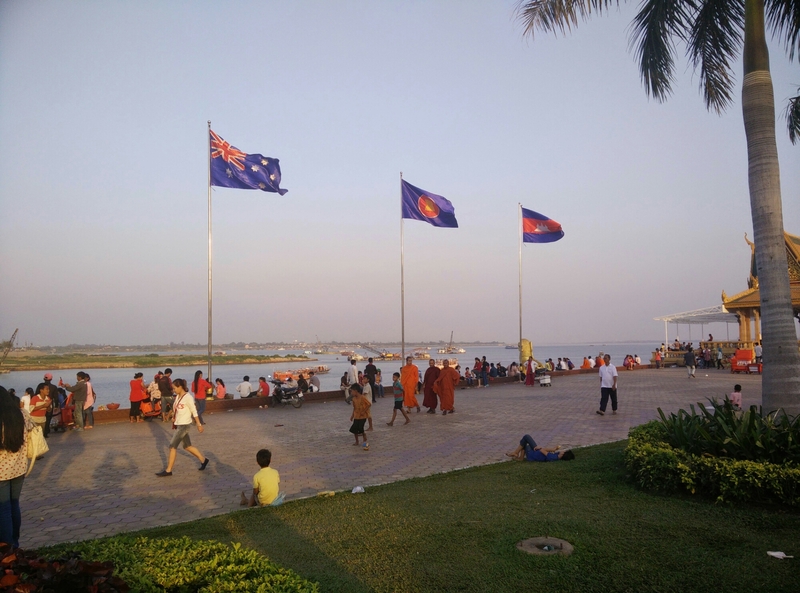 The movie ended – spoiler alert – by talking about the fate of the journalist and his Cambodian colleague, as well as mentioning how Cambodia was still at war. From that post-script, we walked out to a sunset at a rooftop bar overlooking Sunday strollers in the parks and international flags lining the boulevard. T was asking about the American bombings which have rise to the Khmer Rouge, as I marveled that in this week’s paper there was an article about the former prime minister’s wife attempting to bring charges against France for surrendering her husband from asylum at their embassy to the Khmer Rouge (which was portrayed in the film). The case was dismissed as it was decided (somehow) that he offered himself up rather then have all Cambodians at the embassy die. The heaviness was dissipated by a summer night full of life, balloons and two-for-one cocktails. T reveled in watching a fusion game of hacky sack and badminton. It could have been Central Park. We followed one movie with a later documentary screening by the Cambodian Center for Human Rights about the state of human rights today. I was impressed with the turnout and got to sit next to a young man who is part of a local group working to increase awareness and advocacy for basic rights here in Phnom Penh. Land rights were a major concern of the presentation, with forced relocations happening to clear the way for new development. We ended a full day in Brooklyn, or at least that’s what it felt like. 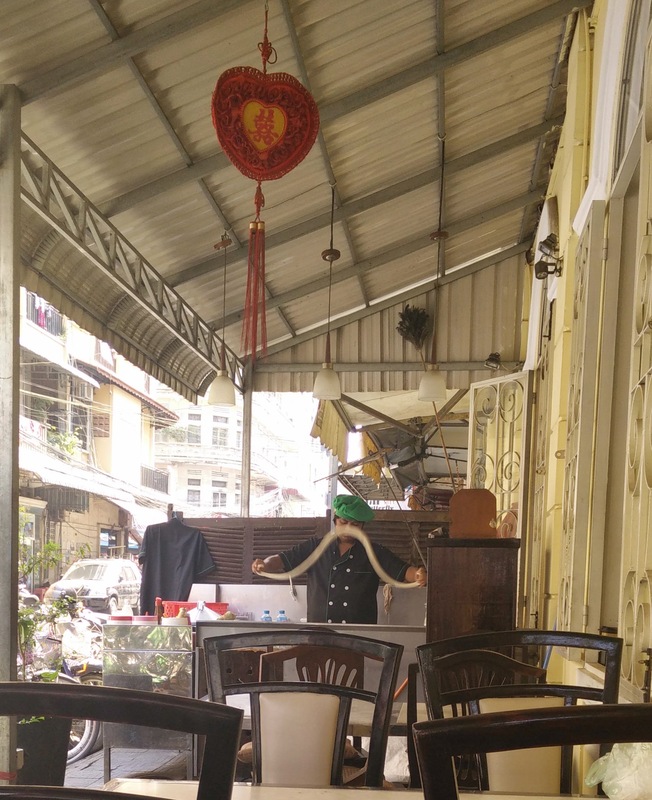 A small alley had been redone with 5-6 small bars with different themes – library, motorcycles, etcetera. But T must have been dreaming of Paris instead as he only had eyed for the crepes nearby! Previous PostYou down with PP?